In Need of Fast Roadside Assistance? 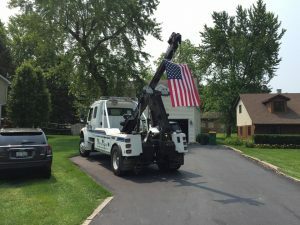 To help you in these stressful situations we employ a fleet of tow trucks offering lightning fast roadside assistance throughout the suburbs of Chicago. We’re available at a moment’s notice to get you back on track as soon as possible and routinely respond to calls in 20 minutes or less. For all of Chicagoland we can be there fast and more than likely have one of our trucks in your area now.